Insta-worthy lips! 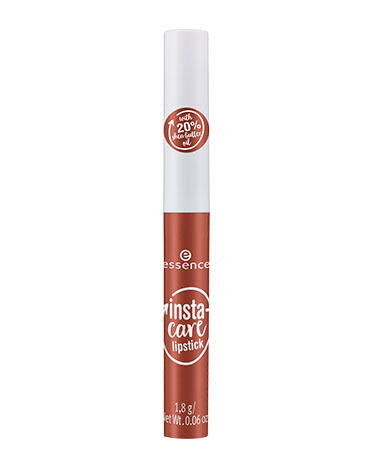 now achievable with the essence insta-care lipstick that will glide on your lips and leave them with a soft swipe of color. The buttery soft lipstick contains shea butter that will also instantly moisturize your lips. Vegan. Paraben and Gluten free. 01| INGREDIENTS: POLYISOBUTENE, BUTYROSPERMUM PARKII (SHEA BUTTER) OIL, CERA MICROCRISTALLINA (MICROCRYSTALLINE WAX), VP/HEXADECENE COPOLYMER, ETHYLHEXYL PALMITATE, BIS-DIGLYCERYL POLYACYLADIPATE-2, CETYL ESTERS, ISOCETYL STEAROYL STEARATE, TOCOPHERYL ACETATE, GLYCINE SOJA (SOYBEAN) OIL, TOCOPHEROL, CAPRYLYL GLYCOL, GLYCERIN, CAPRYLHYDROXAMIC ACID, BETA-SITOSTEROL, SQUALENE, PARFUM (FRAGRANCE), LIMONENE, LINALOOL, CITRONELLOL, GERANIOL, CI 42090 (BLUE 1 LAKE), CI 77491, CI 77492, CI 77499 (IRON OXIDES), CI 77891 (TITANIUM DIOXIDE). 02| INGREDIENTS: POLYISOBUTENE, BUTYROSPERMUM PARKII (SHEA BUTTER) OIL, CERA MICROCRISTALLINA (MICROCRYSTALLINE WAX), VP/HEXADECENE COPOLYMER, ETHYLHEXYL PALMITATE, BIS-DIGLYCERYL POLYACYLADIPATE-2, CETYL ESTERS, ISOCETYL STEAROYL STEARATE, TOCOPHERYL ACETATE, GLYCINE SOJA (SOYBEAN) OIL, TOCOPHEROL, CAPRYLYL GLYCOL, GLYCERIN, CAPRYLHYDROXAMIC ACID, BETA-SITOSTEROL, SQUALENE, PARFUM (FRAGRANCE), LIMONENE, LINALOOL, CITRONELLOL, GERANIOL, CI 42090 (BLUE 1 LAKE), CI 77491, CI 77499 (IRON OXIDES), CI 77891 (TITANIUM DIOXIDE). 03| INGREDIENTS: POLYISOBUTENE, BUTYROSPERMUM PARKII (SHEA BUTTER) OIL, CERA MICROCRISTALLINA (MICROCRYSTALLINE WAX), VP/HEXADECENE COPOLYMER, ETHYLHEXYL PALMITATE, BIS-DIGLYCERYL POLYACYLADIPATE-2, CETYL ESTERS, ISOCETYL STEAROYL STEARATE, TOCOPHERYL ACETATE, GLYCINE SOJA (SOYBEAN) OIL, TOCOPHEROL, CAPRYLYL GLYCOL, GLYCERIN, CAPRYLHYDROXAMIC ACID, AQUA (WATER), SODIUM CHLORIDE, SODIUM SULFATE, BETA-SITOSTEROL, SQUALENE, ALUMINA, PARFUM (FRAGRANCE), LIMONENE, LINALOOL, CITRONELLOL, GERANIOL, CI 15850 (RED 7 LAKE), CI 16035 (RED 40 LAKE), CI 42090 (BLUE 1 LAKE), CI 77491 (IRON OXIDES), CI 77891 (TITANIUM DIOXIDE). 04| INGREDIENTS: POLYISOBUTENE, BUTYROSPERMUM PARKII (SHEA BUTTER) OIL, CERA MICROCRISTALLINA (MICROCRYSTALLINE WAX), VP/HEXADECENE COPOLYMER, ETHYLHEXYL PALMITATE, BIS-DIGLYCERYL POLYACYLADIPATE-2, CETYL ESTERS, ISOCETYL STEAROYL STEARATE, TOCOPHERYL ACETATE, GLYCINE SOJA (SOYBEAN) OIL, TOCOPHEROL, CAPRYLYL GLYCOL, GLYCERIN, CAPRYLHYDROXAMIC ACID, BETA-SITOSTEROL, SQUALENE, ALUMINA, PARFUM (FRAGRANCE), LIMONENE, LINALOOL, CITRONELLOL, GERANIOL, CI 15850 (RED 6 LAKE), CI 19140 (YELLOW 5 LAKE), CI 77891 (TITANIUM DIOXIDE). 05| INGREDIENTS: POLYISOBUTENE, BUTYROSPERMUM PARKII (SHEA BUTTER) OIL, CERA MICROCRISTALLINA (MICROCRYSTALLINE WAX), VP/HEXADECENE COPOLYMER, ETHYLHEXYL PALMITATE, BIS-DIGLYCERYL POLYACYLADIPATE-2, CETYL ESTERS, ISOCETYL STEAROYL STEARATE, TOCOPHERYL ACETATE, GLYCINE SOJA (SOYBEAN) OIL, TOCOPHEROL, CAPRYLYL GLYCOL, GLYCERIN, CAPRYLHYDROXAMIC ACID, BETA-SITOSTEROL, SQUALENE, PARFUM (FRAGRANCE), LIMONENE, LINALOOL, CITRONELLOL, GERANIOL, CI 15850 (RED 7 LAKE), CI 16035 (RED 40 LAKE), CI 42090 (BLUE 1 LAKE), CI 45410 (RED 27 LAKE), CI 77891 (TITANIUM DIOXIDE). 06| INGREDIENTS: POLYISOBUTENE, BUTYROSPERMUM PARKII (SHEA BUTTER) OIL, ETHYLHEXYL PALMITATE, CERA MICROCRISTALLINA (MICROCRYSTALLINE WAX), VP/HEXADECENE COPOLYMER, BIS-DIGLYCERYL POLYACYLADIPATE-2, CETYL ESTERS, ISOCETYL STEAROYL STEARATE, TOCOPHERYL ACETATE, GLYCINE SOJA (SOYBEAN) OIL, TOCOPHEROL, CAPRYLYL GLYCOL, GLYCERIN, CAPRYLHYDROXAMIC ACID, BETA-SITOSTEROL, SQUALENE, ALUMINA, PARFUM (FRAGRANCE), LIMONENE, LINALOOL, CITRONELLOL, GERANIOL, CI 16035 (RED 40 LAKE), CI 19140 (YELLOW 5 LAKE), CI 77891 (TITANIUM DIOXIDE).